We all know that almost a month back, Vivo showcased the Qualcomm’s in-screen fingerprint scanner technology, beating Apple as everyone thought that Apple would be the first to showcase it. Anyways, since the technology has arrived, we can surely expect it to come to smartphones by the end of the year. Since Vivo was first to showcase this technology, we can now expect that the company will be the first to implement it on a smartphone. 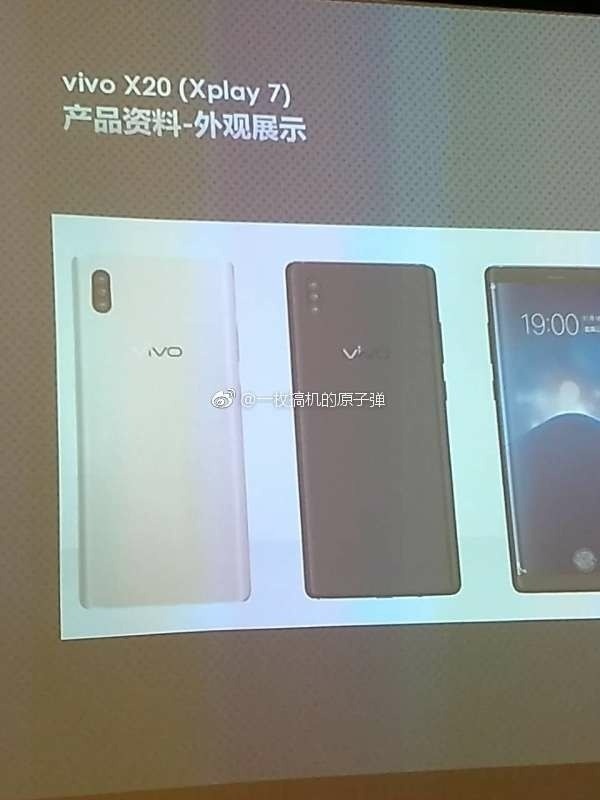 Guess what, The Vivo XPlay 7 (Codenamed Vivo X20) has leaked today via a few shots of the presentation that revealed the design as well as some of the unique features of the phone. So, as the title of the article suggests, this is going to be the first smartphone in the world to come equipped with an in-screen fingerprint scanner. Along with that, it seems the phone is equipped with not single or dual but triple rear cameras, as per the source. This is something that we doubt as the presentation images are not clear and it could be the LED Flash in the middle of two sensors. The camera module is placed vertically, just like on the iPhone 8. But, who knows Vivo might start a new trend of triple camera setup on the back. The Vivo XPlay 7 ( or Vivo X20) does feature a display with almost no bezels at all on the sides and very less space on top and bottom. Also, the screen is curved on both sides, just like on Note 8. We are still not 100% sure about the authenticity of these images and so take these into consideration with a pinch of salt. But if there is any such device from Vivo, then Vivo Xplay 7 (Vivo X20) will surely be a great phone with that in-screen fingerprint technology. What are your views about the design as shown in the images? Do let us know via the comments section.